For those wondering why college basketball teams have exhibition games, the Ducks showed why. No. 14 Oregon got off to a slow start only to eventually pull away in a 77-59 exhibition win over Western Oregon. The Ducks’ roster features many new players and it might take a bit for this team to develop chemistry. Oregon has plenty of individual talent and once it comes together as a team, that No. 14 ranking will be well earned. 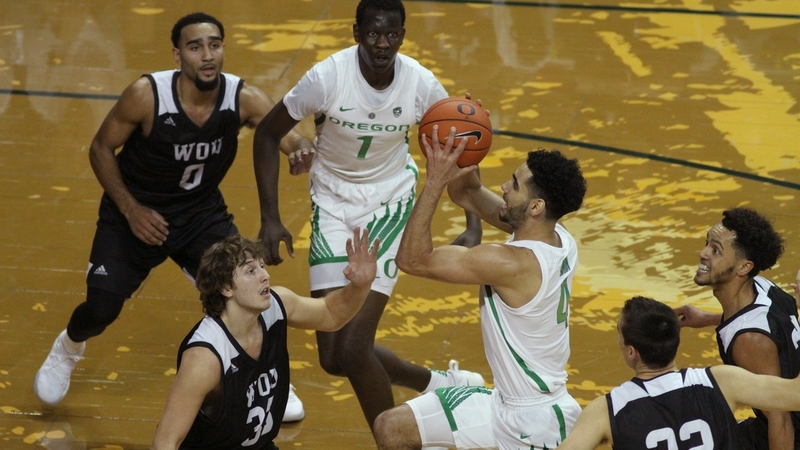 Freshman Bol Bol, who stands at 7-foot-2, led the Ducks with 18 points and eight rebounds. Fellow freshman Francis Okoro added 16 points and 10 rebounds. Sophomore Victor Bailey, Jr. scored 13, Abu Kijab 11 and Ehab Amin also scored 11. Amin is a senior transfer from Texas A&M Corpus Christi. The two teams were even throughout the first half with the Ducks taking a slim 29-27 halftime lead over the Wolves. But then Oregon was able to dominate the second half, outscoring Western Oregon 48-31 for the final 20 minutes of action. This was Oregon’s only exhibition of the year and the regular season, ready or not, begins Nov. 6 when the Ducks host Portland State. Tip off is set for 8 pm on the Pac-12 Network.